AT&T has caught a lot of flak for being excruciatingly picky about what apps can do video chat over data on what kind of plans. It's been equal parts annoying and confusing for everyone involved. But now, the carrier is about to simplify it by letting everyone do everything by the end of this year. Finally. For video chat apps that come pre-loaded on devices, we currently give all OS and device makers the ability for those apps to work over cellular for our customers who are on Mobile Share or Tiered plans. 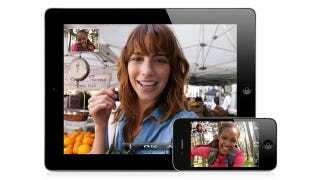 Apple, Samsung and BlackBerry have chosen to enable this for their pre-loaded video chat apps. And by mid-June, we’ll have enabled those apps over cellular for our unlimited plan customers who have LTE devices from those three manufacturers. Throughout the second half of this year, we plan to enable pre-loaded video chat apps over cellular for all our customers, regardless of data plan or device; that work is expected to be complete by year end. Today, all of our customers can use any mobile video chat app that they download from the Internet, such as Skype. Until now, users who wanted to use video-chat applications that come pre-installed on their phones (like FaceTime and recently Hangouts) over data have had to be on Mobile Share or Tiered plans. And while Wi-Fi was the only option for folks holding unlimited plans that had been grandfathered in, until AT&T eventually threw them a 3G bone. Fucntionality has been rolling out slowly, but the whole process has just been absurdly complex.